Rincon Rumbero is back on December 6, 2014. As usual, we start at 3 P.M. and wrap up around 6:00 P.M. 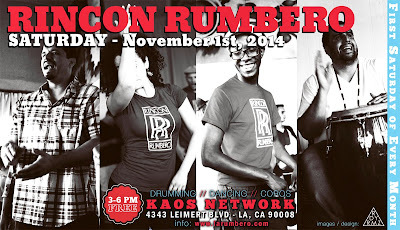 The rumba is held inside KAOS Network on 4343 Leimert Blvd. There is no fee to enter, but you can always donate a few dollars or bring a potluck item. The funds generated go to supporting the KAOS Network, which has hosted the rumba for over two years.